Posted on 25, May 2016 by EuropaWire PR Editors | This entry was posted in Education, Entertainment, United Kingdom and tagged music produced at the University of Aberdeen, Professor Paul Mealor, the Choir of King’s College Aberdeen, the University of Aberdeen Chamber Choir, University of Aberdeen, Vox Regis. Bookmark the permalink. For more than 500 years choral voices have filled Aberdeen’s ornate King’s College Chapel and now they will be heard around the world with the launch of a new record label. ABERDEEN, 25-May-2016 — /EuropaWire/ — Vox Regis – meaning Voice of the King – will showcase music produced at the University of Aberdeen, which is home to a number of important composers including Professor Paul Mealor, and to the Choir of King’s College, Aberdeen and the University of Aberdeen Chamber Choir. Both choirs have garnered an international reputation for the quality of their vocal music and such is their growing reputation that in recent years their singers have been invited to perform at iconic celebrations in front of Her Majesty The Queen, and their Royal Highnesses the Duke of Edinburgh and Prince of Wales, as well as at the BBC Proms and for Songs of Praise and the Watchnight services. 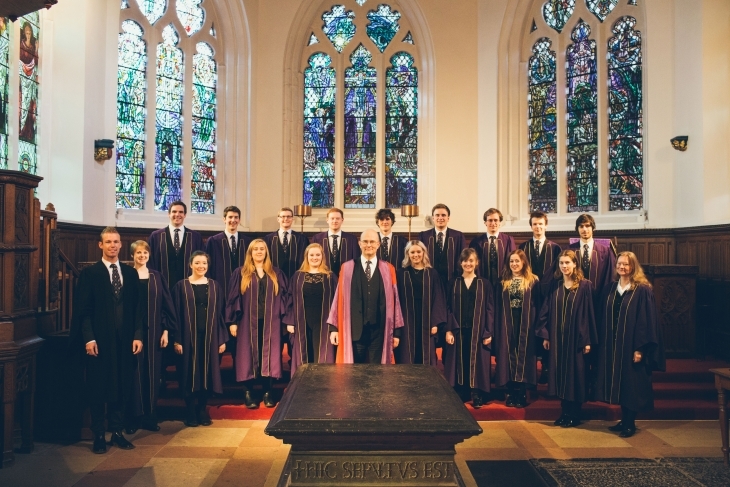 Choral music has been central to life at Aberdeen since King’s College was founded in 1495 when Bishop Elphinstone established a choral foundation of six, later, eight, choirboys and eight singing priests, one of whom doubled as the organist. The boys were expected to sing plainchant, and were trained to improvise polyphony and to read music. Head of chapel and ceremonial music, Professor David Smith, says that this tradition continues to influence the musical output today with both the University’s choirs and composers reaching new highs. “We have a musical heritage of more than five centuries at Aberdeen but the current period represents one of the strongest periods for vocal music. “Our choirs are in high demand and such is the quality of their work that the choirs have been invited to perform at flagship events including the BBC proms and in front of the royal family. The first record to be released on Vox Regis will feature the 22-strong Chapel Choir. The CD takes its name , O sacrum convivium, from a work by Dr Phillip Cooke, a lecturer in Music at Aberdeen whose music features alongside that by postgraduate composers Thomas LaVoy and John Hudson, and a piece by Paul Mealor which was written especially for the Choir. Proceeds from the sale of this CD will support vital research at the University into prevention and early diagnosis of diseases that cause dementia. Professor Mealor said: “This is a truly wonderful disc of the beautifully old and the inspiring new in sacred music. The recording of my own Locus iste, written for this choir, is delicate, emotionally charged and beautifully balanced. The next CD of choral music will be recorded in the autumn by the University Chamber Choir under the direction of Paul Mealor. It will feature musical arrangements of Burns by Aberdeen composers, and be ready in time for Burns Night. O sacrum convivium, featuring the Chapel Choir, will be launched on at the University’s May Festival on Friday 27 May. Recorded in King’s College Chapel, it contains a wide variety of music by composers such as Tallis, Victoria, Purcell, Lotti, Stanford, Stainer, Tavener as well as the new music by Aberdeen composers. It will be available ‘at all good record shops’ worldwide, or for download from iTunes and Amazon. The second album released on the label will be recordings of Scottish bassoon music, and plans are already well advanced for a first recording of cantatas by Ruggieri (a contemporary of Vivaldi), edited by the department’s Dr Jasmin Cameron, whilst the Chamber Choir’s Burns album is scheduled for recording in October.